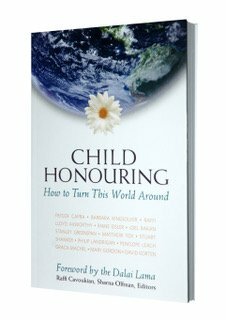 Child Honouring is a philosophy developed by Raffi — a vision, an organizing principle, and a way of life that puts children at the centre of our deliberations and decisions for today and the future. Raffi calls it the children-first way of sustainability. Child Honouring is a children-first approach to healing communities and restoring ecosystems. It views how we regard and treat our young as the key to building a humane and sustainable world. It is a novel idea — organizing society around the needs of its youngest members. Its spirit is invitational — a call to imagine and create a diversity of child-friendly cultures. A child-honouring society would show love for its children, and therefore for all of us, in every facet of its design and organization. In the 1990s, Canadian children's singer, Raffi, had an epiphany (or rather, a slow dawning) that helped him realize that putting children at the centre of our discussions, planning and decision-making at all levels (from personal/family to business/government to national/international) could be transformative and revolutionary. In fact, in response to this new worldview, Raffi created his first CD for adults: Resisto Dancing. "The early years are the most important — early childhood is the gateway to humane being. "We face planetary degradation that is unprecedented in scope and scale — a state of emergency that most endangers the very young, and that requires a remedy of equal scale. "This crisis calls for a systemic response in detoxifying the environments that make up the world of the child." The essence of the vision of child honouring is expressed in A Covenant for Honouring Children, written by Raffi and inspired, supported and signed onto by dignitaries of all faiths and creeds around the world, such as Jane Goodall, the Dalai Lama, Nelson Mandela, Riane Eisler, Matthew Fox, Fritjof Capra, David Korten and Barbara Kingsolver. Here are the nine guiding principles that, taken together, "offer a holistic way of restoring natural and human communities, thus brightening the outlook for the world we share." You can read the full Covenant for Honouring Children and download it here. "Although it was a privilege to write and perform music for children, it is adults who have the responsibility of making a viable future for this planet. I am gearing my efforts toward those in a position of influence – policy makers, educators and all who make a difference in people's lives and in the shaping of minds. I feel that we are at a historic juncture in our species' evolution and I must do what I can to help us get through what Peter Senge called 'this dangerous passage.'" "'Compassionate revolution' means a completely nonviolent 'turning' in which the youngest among us is at the heart. Every culture and faith has newborns whose brains and bodies grow in exactly the same way, which is a unifying principle. In joining this revolution, I ask people to take some deep reflection and then, if so moved, to embrace the covenant for honouring children and its nine principles." An ancient Chinese adage states that it is the mark of every Golden Age that children are the most important members of the society and teaching the most revered profession. Recently, Raffi found himself moved to "sing" a new paradigm into being. As I read Child Honouring, I wonder, Could this not be the song for us all? Could this not be the single thought that steers us through the dangerous passage — a world that honours all its children? Many people don't realize that the UN Convention on the Rights of the Child is a legally binding international instrument developed in 1989 to recognize that children have human rights, too. and the right to participate fully in family, cultural and social life. and respect for the views of the child. and legal, civil and social services. Children have the right to good quality health care, to clean water, nutritious food and a clean environment, so that they will stay healthy. Rich countries should help poorer countries achieve this. N.B. Only two countries in the world have not ratified the Convention on the Rights of the Child. Kindly contact GreenHeart Education if you hear that Somalia or the United States of America has finally ratified it. — and truly working towards it? It's certainly one way of honouring the sustainable development principle of intergenerational equity ... and the indigenous concept of the Seven Generations. And please visit Raffi's Child Honouring in Schools to learn more.